Kelly Gauthier grew up in a family of renowned artists and creative individuals. At an early age she came to understand the essence of art, its amazing potential, and the ability to heal that lay beneath it. Although Kelly was an out going child with a real spirit and enthusiasm for life, she experienced great difficulty when it came to expressing her emotions. Kelly's father had a love for photography and wanting to share this with his daughter, he surprised her with a camera on her 10th birthday. Without intention, Kelly's father had provided her with the key to unlocking her emotions. The camera quickly became her means of expression. With a passion for photography and an innate desire to help others, Kelly went on to obtain an Honors B.F.A. in Still Photography and an Honors Diploma in Art Therapy. 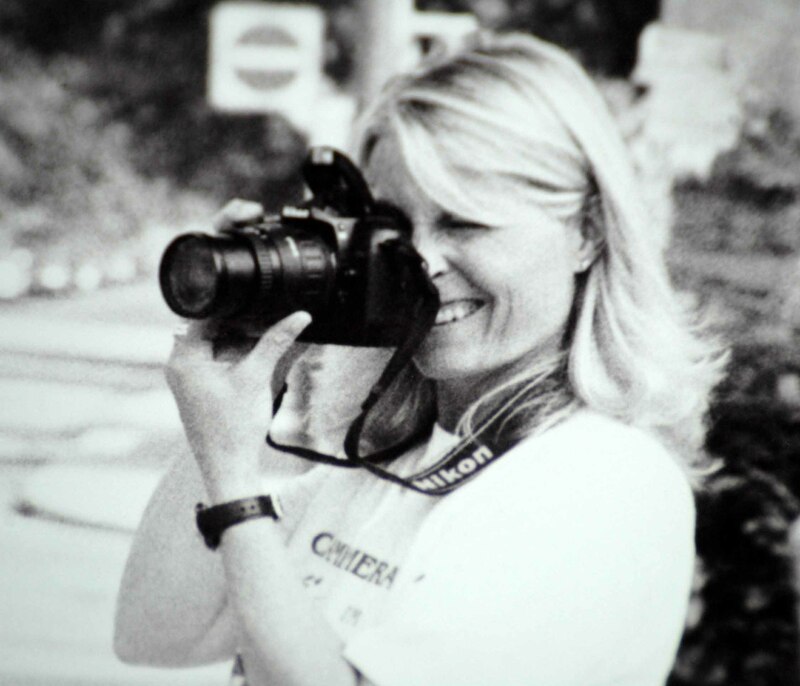 Prior to obtaining her Diploma in Art Therapy, Kelly owned and operated CAMP CAMERA, a photography camp for children. It was this experience that led Kelly to further her education and combine her passion for photography and desire to help others into a now successful Art & Photo Therapy Practice. Kelly has spent the better part of 20 years working with clients in child care facilities, schools, multidisciplinary centres, and hospitals. She specializes in PhotoTherapy and has perfected the use of Projected Imagery in therapy. Kelly works extensively with children, adolescents, adults, and families who have experienced abuse and trauma, and has helped many recognize the gifts they possess and the potential life holds for them. As a professional photographer I have learned over the years that a photograph is never simply its depiction, but rather its story and how it pertains to or affects the viewer (or the taker). It can have a positive or negative affect, but regardless of which, it is the affect itself that contains the importance. When you look at a photograph you can see a great many things that are often intentional. For instance, looking at the photograph below you can see a woman who appears comfortable with the horse she is with, and a horse that appears equally as comfortable with the woman it is with. You might also see the kiss as a form of expression and lover, and the hand gesture as a sign that the woman is comfortable touching a horse. However if we were to look a little deeper what might we see? We might possibly see a woman who is a bit reluctant to fully embrace the horse, maybe our of fear or because the woman has created personal boundaries that are getting in the way of letting her do that. If we were to keep looking, we might also see a woman who is missing love in her life and longing to have a special connection with someone or something. Could this horse be a way for her to feel that connection? Or is the horse a safe way for her to express her love without being hurt? Any or all of these questions could be correct and then again maybe not. That's the beauty of using photographs as a tool to uncovering and understanding ones self. Each photograph will have and take on a different meaning for each viewer despite the constant that it contains. Having grown up in a family of renowned artists and creative individuals, I have come to understand the true essence of art, its amazing potential, and the ability to heal that lies beneath it. Although I was an outgoing child with a real spirit and enthusiasm for life, I did experienced a great deal of difficulty when it came to expressing my emotions. Thankfully my father, who had a love for both art and photography, believed in the importance of nurturing creativity. On my 10th birthday he surprised me with a camera and without intention, my father had provided me with the key to unlocking my emotions. The camera quickly became my best friend and means of expression. Over the years my love for photography has taken me in many different directions and what started out as a hobby quickly became my profession. After obtaining my degree in Still Photography from Ryerson University I opened a private studio, focusing most of my attention on weddings, environmental portraits, and black & white social documentary. If I wasn't photographing a wedding or shooting a portrait, I could be found wondering the streets of Toronto with my camera, taking in the lives that surrounded me and all that came with them. It was the raw elements of "real life" that I found fascinating and visually moving. It was this experience that lead me to open CAMP CAMERA allowed me to teach children the basics of photography while encouraging self-expression and creativity. Having experienced the positive affects of photography first hand, I knew I had to help other children find their voice. The rewards that came from watching these children take photographs and share their excitement and insights into themselves with each other was immeasurable. This experience coupled with my innate desire to help others, was what lead me to further my education and become an Art Therapist. With my degree in Still Photography and Art Therapy, I was now able to offer others my passion for photography and awareness for mental wellness in a more professional capacity. I have since worked in a therapeutic capacity within a variety of mental health facilities, schools, multidisciplinary centres, and hospitals. I have had the privilege of working with a variety of populations and have developed an insight into the use of photographs with those living with addiction, autism, PTSD, anxiety, and abuse. I am so thankful to be in a profession that allows me to help others recognize the gifts they possess and the potential that life holds. Through my own creative process, education, and practical experience, I have learned the importance of creativity in self acceptance and forgiveness. CAMP CAMERA - 15 years operating CAMP CAMERA offering educational photography programs to children and youth within Ontario. Picture Yourself Well - 6 years operating in a professional capacity offering individual and group Art & Photo Therapy services to adults, children & youth - 4 years facilitating The CTP (Communication Through Pictures) System programming to health and educational facilities. NEDIC - 6 years offering professional services to children and youth living with eating disorders. Wellspring Foundation - 4 years working in a professional capacity offering Art & Photo Therapy workshops and counselling to individuals living with and coming to terms with cancer. Abnormal Psychology, Developmental Psychology, Introduction to Philosophy, Critical Thinking, Friend to Friend/Autistic Spectrum Disorder, Integrated Play and Children with Autism, Heart Matters, What is Attachment Disorder, Brain Gym, Teaching to Involve the Twelve Senses, United Way Learning Summit, Let's Get Physical, Impact of Sensory Integration on Behaviour, Literacy and Children. Almost everyday we meet individuals who need help with emotional problems, but sadly they have no idea where to start. Their problems can include serious issues such as anorexia and bulimia, bipolar disorder, depression, and schizophrenia, but for the most part they consist of the normal day to day concerns that affect each and everyone of us. Changes in a relationship, the loss of a job, or stress around the past or the future, is enough to lead one in search of help. It is my belief that so many decide not to seek therapy due to a lack of knowledge and trust. The fear that comes with deciding which therapist, which type of therapy, and why, keep many individuals from getting the help they need. At times this fear can become more overwhelming than the issue itself and can add to ones unnecessary suffering. We all need to become more educated around psychological treatments and their benefits. Taking the mystery out of psychological therapy and letting people know what treatments will work best for their individual problems can be the first step to alleviating their fears. The goal is to provide help for those in need and aid in their recovery. With an open mind and an open heart, I believe we can do this. As an Art and Photo Therapist, I have had the privilege of working with a vast array of populations. My practice has allowed me to work with individuals with disorders such as ADHD, Autism, Asperger's, FAS, and NLD, and have included children, adolescents, adults, couples, and families suffering with relationship concerns, anger, anxiety, depression, and post-traumatic stress disorder. I have also facilitated a number of group therapy workshops for adults plagued with addictions and children with neurocognitive disorders. This experience and these individuals have opened my eyes to the many problems and disorders that can and do affect us on a daily basis. It has taught me the value of being a good listener, of being present, and of providing a safe and accommodating space. As a therapist I believe it is my responsibility to be aware while remaining still, to allow my clients to direct me where they need to go, and to provide them with the comfort, knowledge and freedom they need to express themselves openly and without judgement. While I believe myself to be mostly client-centered, I have left myself open to other processes such as solution focused, Gestalt, CBT, REBT, and existentialism. My focus is always on my client and determining the best course of action dependent upon his or her particular needs. Any one of the above therapies may or may not be suitable and I strongly believe that as individual as the client is, so must be the process by which we guide them. History has given way to the direction in which I intend to go. My love and experience lies with children and their families, and the hope of our future. Having had three children of my own and having worked with this population for over 20 years now, I have gained a great deal of experience, knowledge and understanding. I am able to assist children with their needs while building trust and making them feel comfortable and safe in my presence. I have an innate ability to recognize a child's need to be heard, to be listened to, and to be still. Too often we equate children with the ability to forgive and forget, and far too often it is this kind of thinking that leads a child away from the playground and into therapy. I believe we have a responsibility to these children and their families to provide them with the security and confidence they need to experience and enjoy a full and rich life. My hope is to provide children and adults alike with a safe and welcoming environment that will allow for personal growth and development. A place where individuals of all populations can come together and be themselves, while sharing their pasts, their presents, and their futures.